Almecija, Sergio, Jeroen B. Smaers, and William L. Jungers. In the wake of an earlier finding challenging the direct link between brain size and brain complexity in primates, there comes a study demonstrating that the human hand is closer in its proportions to that of the last common ancestor of chimps and humans than the chimp hand. Hand proportions are a simple proxy for dexterity and dexterity, in turn, is strongly associated with tool use. Interestingly, while humans and big apes are clearly opposed in their IHPs index (human thumbs are longer, while their digits are shorter), South American Cebus overlap with humans (see Fig. 1 on the left). We’ve already seen a similar result from (Padberg, Jeffrey, et al. 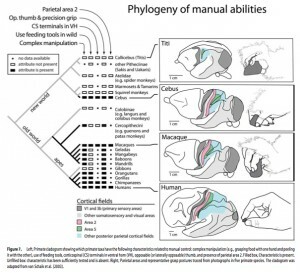 “Parallel Evolution of Cortical Areas Involved in Skilled Hand Use,” Journal of Neuroscience 27 (38): 10106-10115) who showed that humans are Cebus uniquely share all of the brain and physical characteristics of superior manipulative behavior. Almecija et al. 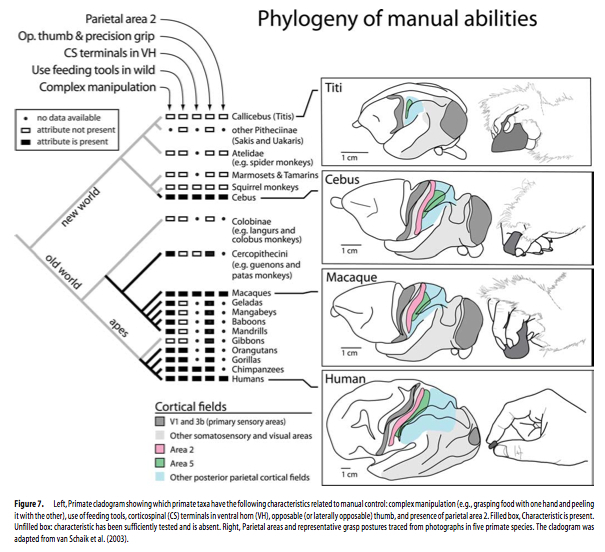 (2015) are correct in attributing this remarkable parallelism between humans and Cebus to evolutionary convergence. However, the intriguing aspect of this convergent “kinship” between humans and a Platyrrhine genus is that in humans this trait predates the split between Homo and Pan. When we hear the term “convergence” we typically picture a trait – a look-alike of a character present in a distantly related species – that emerged in a species after its split from a closely related species. 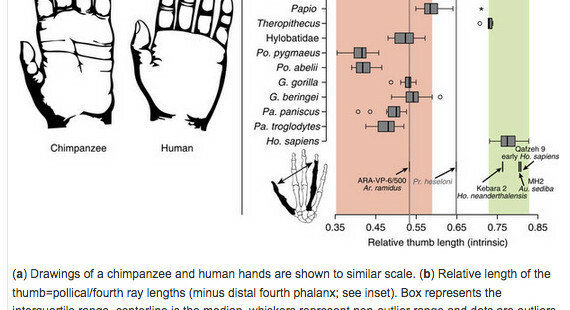 But in the case of human hand proportions, humans are more primitive than chimps. Among the fossil specimens studied by Almecija et al. 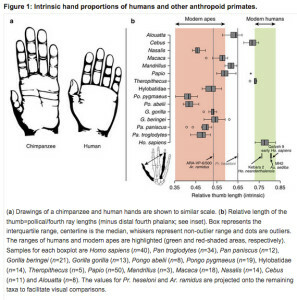 (2015), Theropithecus brumpti (a 3-2 MYO large-bodied monkey species from Ethiopia known for its highly dexterous hands) also showed an overlap with humans (and Cebus) in the IHPs index suggesting that the chimps (and other big apes) were the ones who diverged from a primitive prototype. This study adds to the growing awareness that chimps and humans, while extremely close molecularly, are rather divergent behaviorally. At the same time, the forces of convergence have made living South American primates humans’ closest “kin” when it comes to the sharing of such quintessentially human traits as weak sexual dimorphism, high manual dexterity, cooperative breeding and communicative abilities. What Almecija et al. (2015) add to this picture is the unsettling possibility that those “convergent” traits that make us largely who we are behaviorally did not emerge after our split from chimps or after the emergence of genus Homo. In fact, they are plesiomorphic in primate evolution.